The Jeep Grand Cherokee is completely redesigned for 2005. With more steel and less glass, a laid-back windshield, the trademark giant wheel well flares, and a slickly angular body without cladding, the new Grand Cherokee looks more muscular than its predecessor. The interior's build quality is dramatically improved, although the Grand Cherokee remains short on leg room. A Hemi V8 is available for the first time. 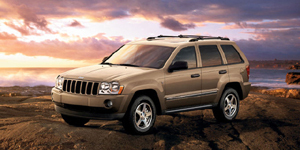 The 2005 Jeep Grand Cherokee SUV is powered by a base 3.7-liter V6 with 210 hp. Other available engines include a 4.7-liter V8 with 235 hp and a 5.7-liter V8 Hemi with 325 hp.